HAND LINES - The palmar creases according palmistry & medical science! • EMBRYOLOGY: Palmar crease morphogenesis! • PRIMATOLOGY: Palmar creases in primates? • EVOLUTION: Palmar crease devolopment in time! • HAND LINE STUDIES: Males vs. females, Down syndrome, autism... what do hand lines reveal? • HOW TO RECOGNIZE a 'complete' Simian Line? • WHY THE NAME Simian Line? • The hand in DOWN SYNDROME! • The hand in FRAGILE-X SYNDROME! • The hand in DIABETES MELLITUS! • The hand in RHEUMATOID ARTHRITIS! • The hand in PSORIASIS! • The hand in SCHIZOPHRENIA! • MARFAN SYNDROME hand test! • What can finger length reveal? & HANDS ON HEALTH CARE!! LEARN TO RECOGNIZE & UNDERSTAND THE MOST IMPORTANT LINES IN THE PALM OF YOUR HANDS! While the 'primary palmar lines' are quite well-known, a proper understanding of the other lines is often helpfull to recognize the most significant characteristics of the palmar creases. "On the basis of crease and crease form it is possible to assort primary crease from secondary and tertiary type. Primary creases are embryonic in nature and are pre-ordained in their shape and position on palm or sole. Primary crease has a distinct base, terminal end and a core. The core of a primary crease determines its dominance and primary characteristics." This sort of impicates that for practical purposes primary creases can be recognized by dominance in anatomical structure (featured by: length, width and deepness). • 5 - all other lines are 'accessory creases'. 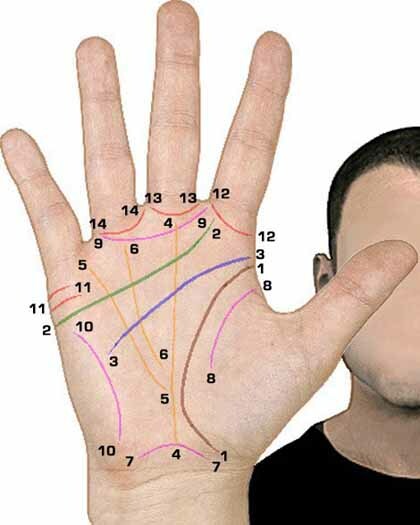 The picture displays for each line the most common palmar location, and the table describes common used names - according palmistry & medical science. NOTICE: The 'primary palmar creases' starts developing in the 2nd month (life line + heart line) and 3th month (head line) in the fetal hand; the 'middle finger crease' starts developing in the 5th month. All other creases follow much later. Only the 'primary palmar creases' display permanent characteristic after birth - all other lines may show signficant fluctuations during a lifetime (they can appear and/or completely disappear). The section palmar crease embryology presents more details. After getting familiar with the basic principles of all common palmar lines, one can start to identify the formation pattern of the 'primary palmar lines' according the 'PIC-model'! ...more.